I will be moving all of my finale tips to this page. 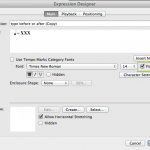 Please note all examples are done using Finale 2011. For examples of how to do some of these things in the ‘other’ program, Philip Rothman of NYC Music Services has kindly translated them. Here they are. 3. 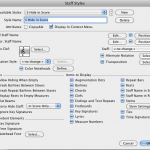 Plugins>Scoring and Arranging>Global Staff Attributes. 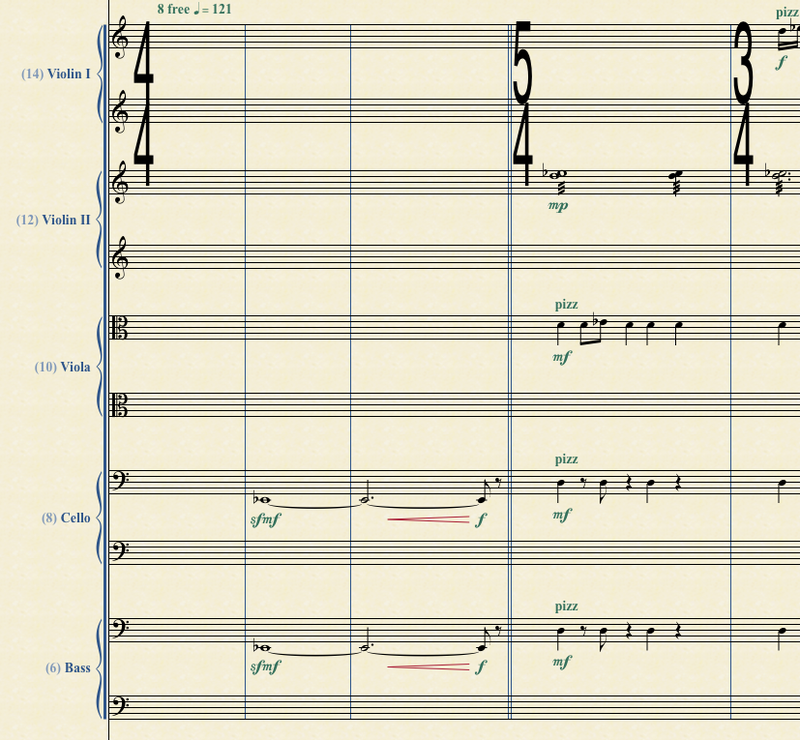 Turn off Time Signatures in all staves but the first of each section (Flute 1, Horn 1, Timpani, Violin 1). 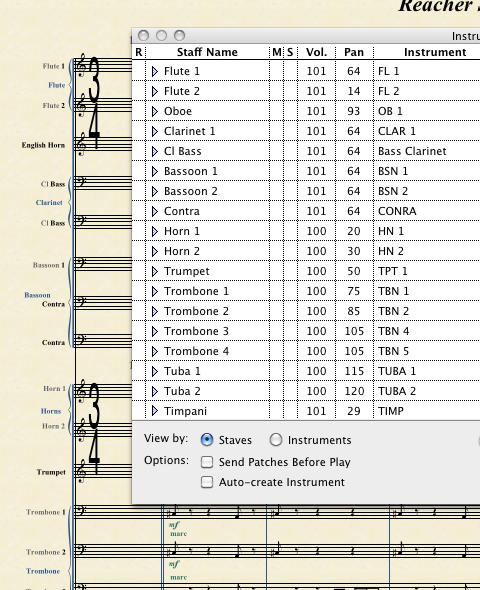 While I never optimize in the pocket score sense, I do have some staves that are set to hide. For example, my template has an extra staff for each string part that will hide when not in use, but I always want to have the regular five staves showing. 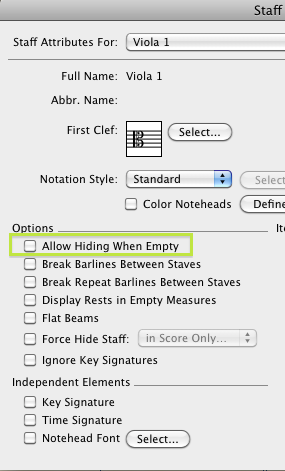 The trick to this is to turn off ‘allow hiding’ in all of the staves but the extra ones. 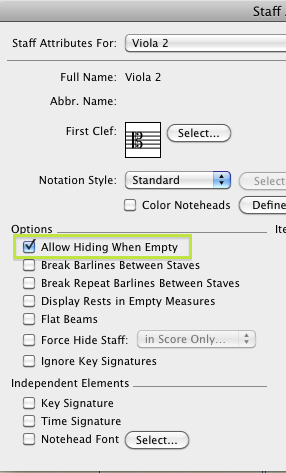 Then when you run the hide staves command, it will only get rid of the ones you don’t want to see. If a staff is not needed for a whole cue, I will hide it. 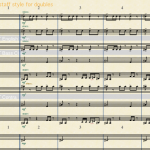 I never delete them, as I may need to add something later or insert the cue into another one, so it is important that each score has the same number of staves, even if some are hidden. 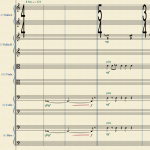 My scores also contain the sketch, which I do not want to show in page view. The solution is another staff style that forces the staff to hide, even when it has notes. 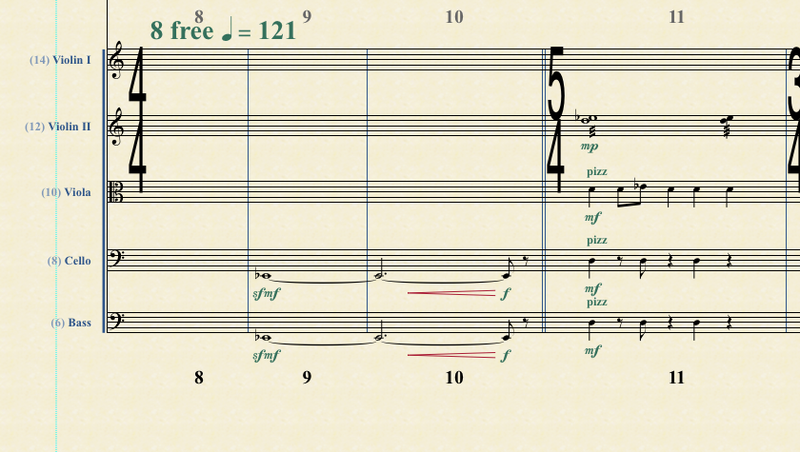 When working on a large score it can be hard to find your place, as the measure numbers are at the bottom, often off the screen. 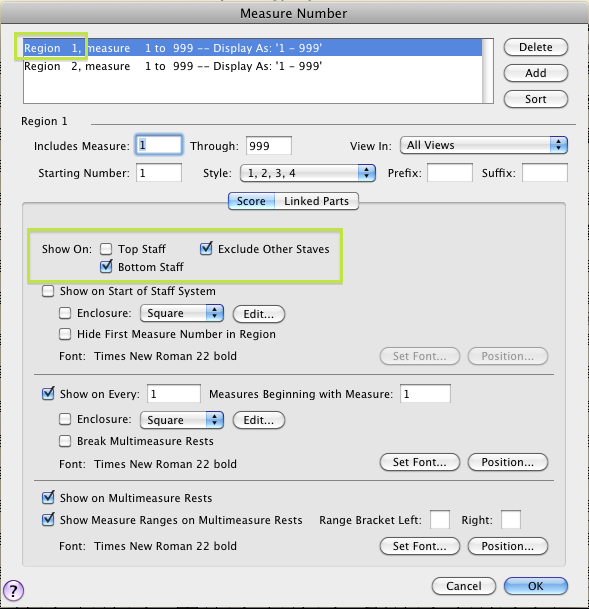 To make life easier, I create two measure number regions. The first region is the one that will print, and is set to display below only the bottom staff. The second region is positioned above the staff and set to display on all staves, but I then edit each staff’s attributes to turn measure numbers off in all staves except for the top one of each section. The most important part of this is to make sure your second region is using hidden text so it only shows on the screen and will never print. Using this system, I can always see where I am. I like to use a group name for the instrument and then the staff name is just the number (1,2) or the alteration (Contra, Bass etc). The problem with this is that in any list of the staves in the program, you will just see lots of 1’s and not know who is who. The trick is to use full names, but hide the actual name so we only display the number. 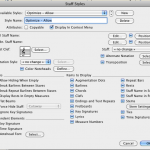 For doubling I use a staff style to change the name on the staff. 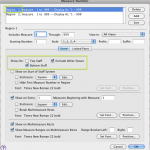 Tempo and other score indications should be large enough for the conductor to read easily. 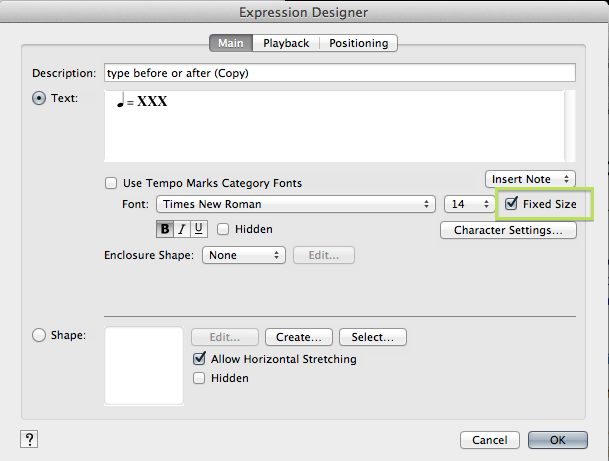 The best way to accomplish this is to use fixed size fonts; my standard is Times New Roman Bold, 14 pt. 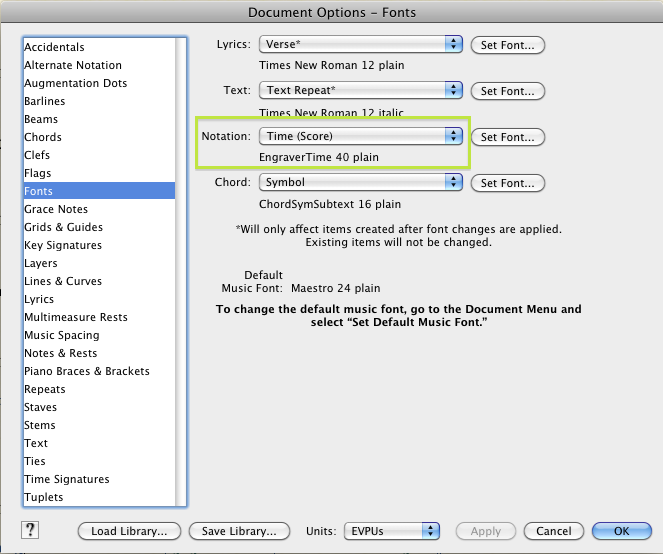 I also like the quarter note in the tempo indication to balance with the rest of the text, so I will set it at 12 pt (Engraver Text). 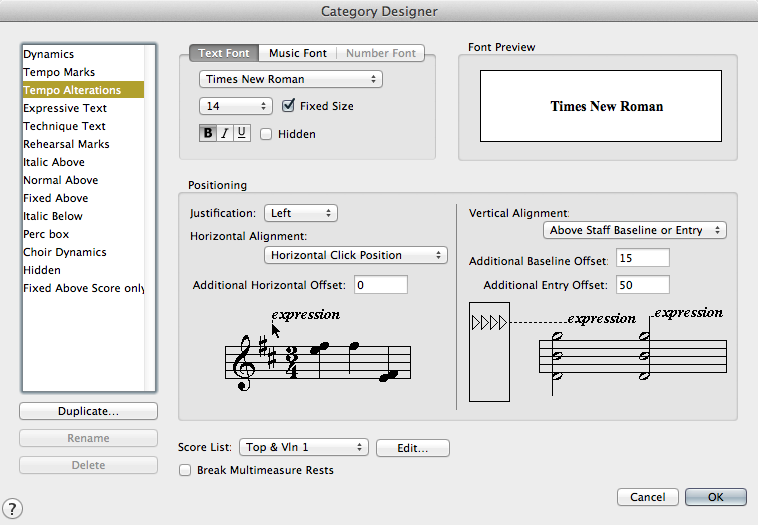 Note that to do this, you will have to uncheck “Use Tempo Marks Category Fonts” and set these fonts manually. I also use 14 pt bold text (not fixed) for my normal expression indications. As always, you should have a template set up with ‘dummy’ entries you can duplicate when necessary, instead of having to create everything new each time. 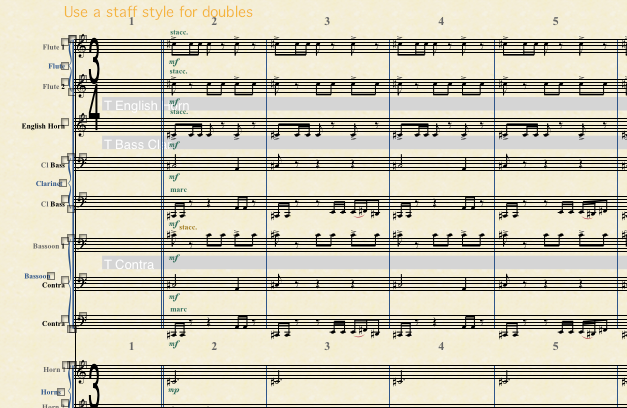 Speaking of setting things up, in the second image below, you can see the various expression categories I’ve created to sort score markings. 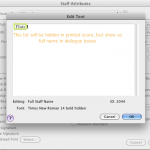 This allows you to set various default behaviors for different kinds of expressions (for example, if I want score text to attach to the left barline or click position). I’ve set up a series of QuicKeys that let me create or duplicate an expression in a given category without spending time in menus. I will post a demo of how that works soon. I really enjoy your website and info re: finale tips. I am a Mac user with v. 26. I am engraving my partner’s book and have hit a road block. 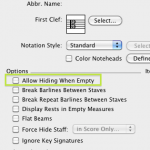 How do I change the time signature to allow me to place 8 whole notes in one measure for a scale? I have engraved his 3 books, but I don’t use Finale often enough to remember how to do this. I was hoping you could help me? One question: Which version of Finale are you using today? v25? or earlier? For I’m having a lot (a lot!) of trouble with the performance of v.25.5 and even with 2014.5 (but this one works better performance wise for me) especially with large scores. Love your blog. 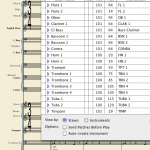 But is there a reason for you choosing to use Finale over its competitor Sibelius? I’ve always been able to score way faster in Sibelius and then in Finale but that just may be a personal preference. I do not like the look of the other program. 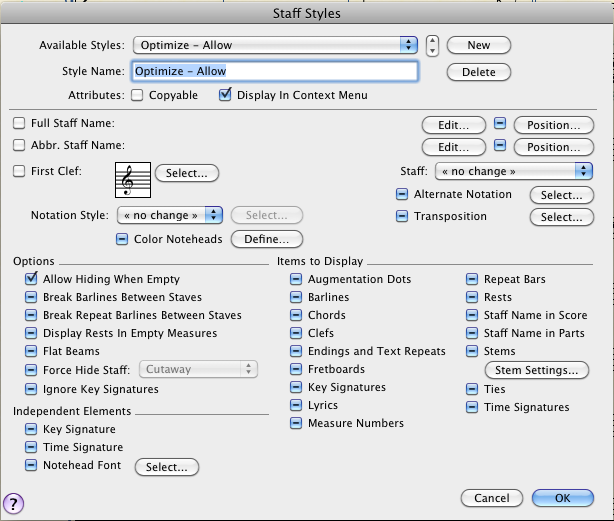 The default settings have a few really silly things in them and most people leave them. For example the parenthesized cautionary accidentals it puts on tied notes over system breaks and magnetic layout can screw up and move things to the wrong place. Finale can look bad too, but it is way more flexible. I started with finale and have never used the other one, have not felt the need. Hi Tim, just an update, in case it might be useful for other users. It works as you describe on mac. But hiding part of the full staff name doesn’t seem possible on Windows 7 Finale 2014. Hi Tim, how do you hide only part of the staff name, so that only the number prints? on a mac it is command/shift H.
Hi Tim, that was the first thing I tried, but hides the whole name, including the number. Were do you use the short cut? When you click on the staff name on the score or in the score manager? Thanks for your time. 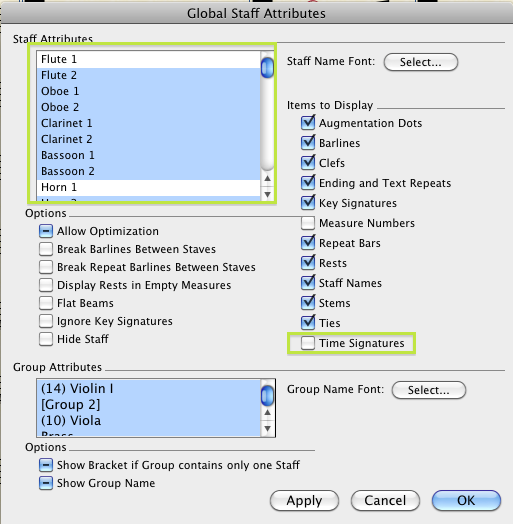 Highlight just the part of the text you want to hide (in this case the instrument name itself, not the number) while in the staff attribute dialog, while editing the full staff name and abbreviated staff name. 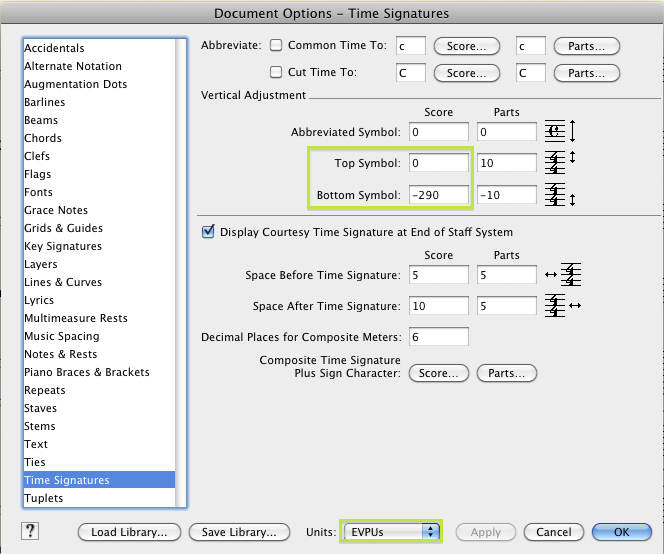 Then press ctrl+h or cmd+h in mac while highlighting the instrument name, but NOT highlighting the instrument number. This leaves the name in for the copyist, but leaves the name out for the printed score. Been working through a few of these. Some taking me ages to do, mainly creating + naming the groups then renaming the individual instruments to have hidden text but visible number. Any advice for how to speed this up? Not really, it does the a bit of time, but worth it once it is done. Do it once then make that your template, start your next piece from that file. 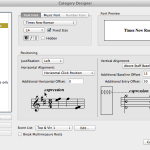 how do you print individual instrument parts from the score? That is a little complicated, I suggest you check out the manual. 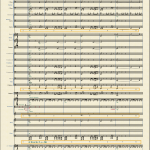 to print,or get get you parts out of the music score on Finale (Windows Version ) go to,FILE,upper left corner,click it,go to export,this will put you parts out of the score.Than you can click on print if you want to print the parts !!! Very interesting approach with regards to extra staff and using optimization to hide them when not used. 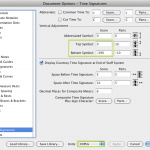 Have you found a way to have one template that you can quickly and easily adjust the instrumentation for a given project or cue or do you use several different templates instead? 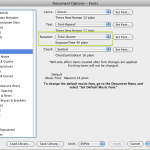 Or perhaps you use the Document wizard and apply document style? But then I guess that would not have all you hidden staves and other customized items. I realize you are already plenty generous with your time and sharing your knowledge but any possibilities you could share your Finale Template? I update the template for each project. I start with the previous one so any improvements I have made appear in the next project. I never use the document wizard. Due to all my quickeys and needing to make everything act in a very predictable way, I always make any changes manually. 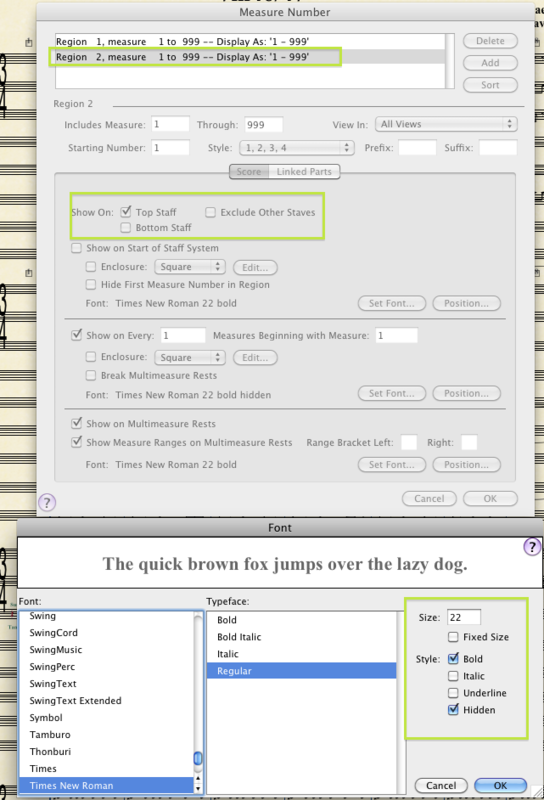 A project may have several templates for different size orchestras. We often use Large, Medium and Small sized bands as not every cue needs full woods or brass etc. I will post a template one day soon. 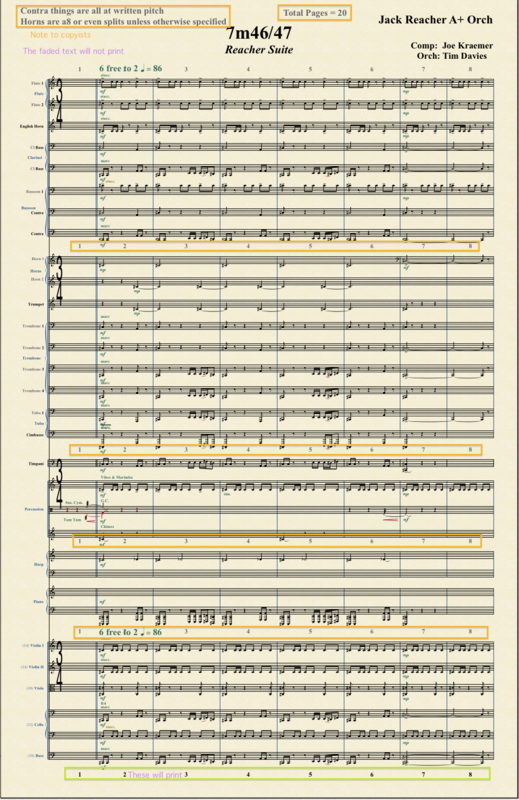 I used to prepare my sketch on the main screen, creating a part called “Full score” where I would set up the layout without draft staves. 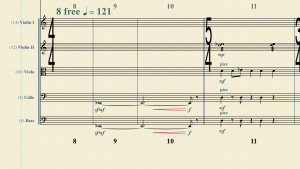 With your procedure, I guess the large time signatures would not easily be applied to this part only… is there a work around or should I abandon making a part called “Full score”? Not quite sure of your method. 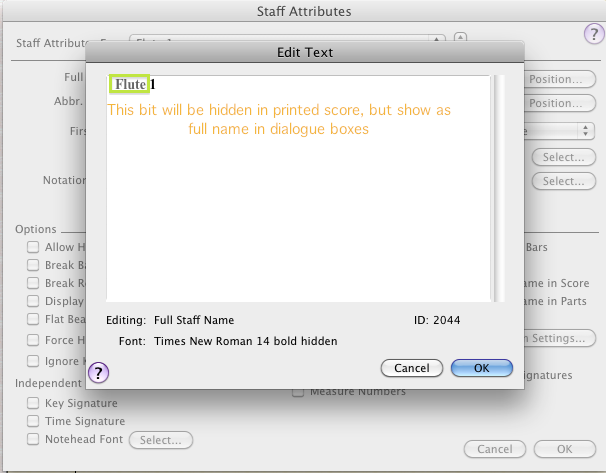 I am able to have a perfect score, sketch hidden and parts in the one file. 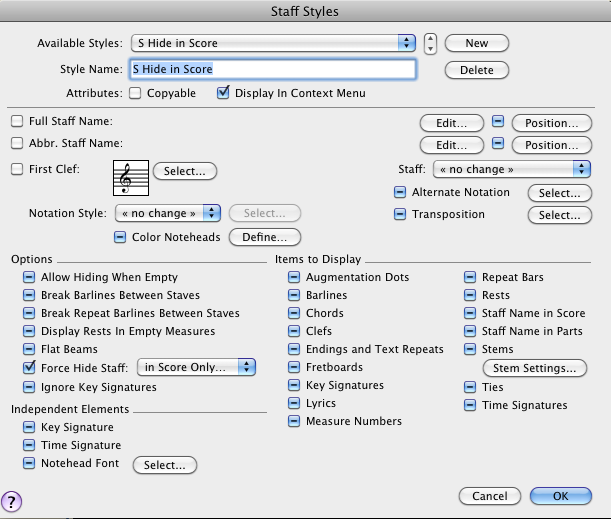 It is all about setting the score up right, then using staff styles (to turn rests and time sigs back on) applied the ‘this part only’. We use a quickey that applies it and pasts the layout from part to part so it is quick and easy. I will do a post on how we do it when I get some time.